When it comes to medical emergencies, you know when it’s time to see a doctor or visit an emergency room. A broken arm, chest pain, severe bleeding, these are all obvious signs that you need to see an emergency doctor immediately. But what should you do when you wake up with an aching tooth or sensitivity? When is it time to call after hours vs. wait until regular business hours to address a dental issue? What does emergency pain vs. non-urgent discomfort feel like? Today, an emergency dentist is prepared to answer precisely that. Loose, displaced or knock out teeth–It’s normal for teeth to have a small amount of movement due to the periodontal ligament. However, teeth should never feel so loose you can move it with your tongue or with very little pressure. That’s a sign that gum disease, trauma or dental caries have damaged the supportive tissue holding the tooth in place. Swelling–Another common sign of a dental emergency is swelling in the gums, cheek or jaw. This is a sign that a localized infection is developing and usually accompanied by large amounts of pain and discomfort. Bleeding–A small amount of bleeding can come from unhealthy gums or localized trauma during brushing or eating. Bleeding from trauma or that does not stop on its own should be evaluated. Pain–It may sound surprising, but certain oral sensations are difficult to define as a dental emergency or not. For example, tooth sensitivity happens to most people and is usually caused by external stimuli from either hot or cold food or beverages. If your teeth go back to feeling normal once the stimuli is removed, it’s not a dental emergency. If you taste metal, have constant headaches that seemingly won’t go away, or have a canker sore or ulceration that doesn’t heal after a two-week period, these are all reasons to visit a dentist for a closer examination. In the case of oral problems, it’s much better to be safe rather than sorry. How Will My Emergency Be Handled? Dental emergencies are handled based on the symptoms. 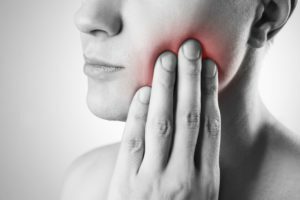 Therefore, if you woke up this morning and started feeling pain seemingly out of nowhere, the dentist will ask you about your oral care routine, diet, and if this symptom has happened before. They’ll also perform X-rays in order to locate the source of the problem before effectively treating it. One solution for an oral infection typically involves antibiotics, painkillers and a root canal to remove the infection directly. If your tooth is broken down, either from an accident or from tooth decay, they’ll examine the extent of the damage so they know whether a filling or crown can restore the tooth. If not, they’ll likely need to perform an extraction. Are you experiencing a dental emergency? Don’t put off treatment. Schedule an appointment today! Dr. Christel Cochell earned her DMD degree from OSHU of Portland. She’s been helping patients treat dental emergencies since 2005 and is even open most Fridays. If you need a dental emergency handled as soon as possible, don’t hesitate to contact her through her website.